The Chain Catcher is a precision component that enhances the overall function of your drive train while protecting your valuable frame. The Chain Catcher is CNC machined from 6061 T6 aluminum for durability and a clean mechanical finish that integrates with all high-end gruppos. 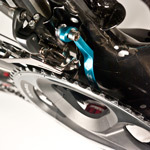 The Chain Catcher is perfect for anyone who likes to keep their chain in place, improve shifting performance and protect their frame from damage caused by a derailed chain. 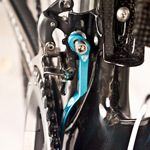 Fitment: All braze-on type mount and clamp style braze-on mount front derailleurs. 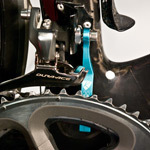 Hardware: Includes all mounting hardware for all brands of front derailleurs.